This cute little wood nymph is my personalized brunette butterfly fairy for children. 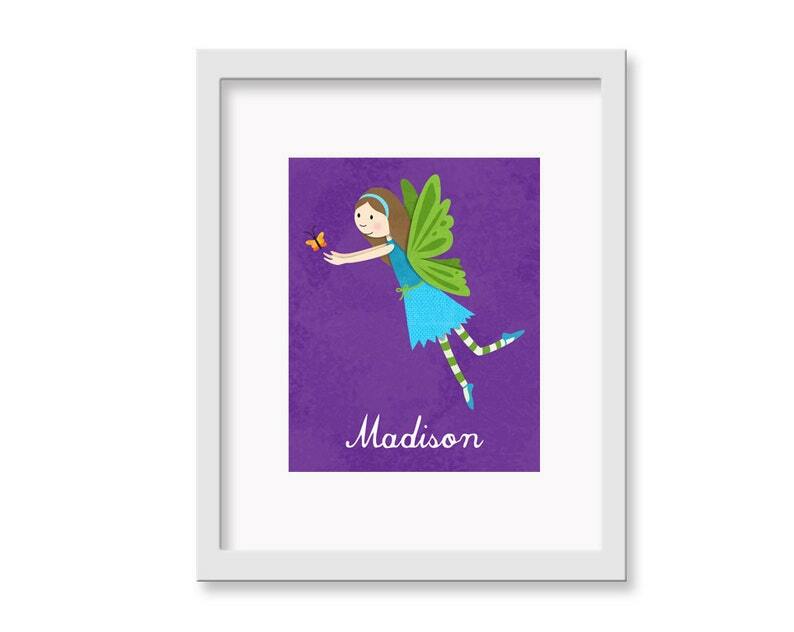 This children's fairy print is personalized and is a fun idea for a nursery or playroom! The butterfly fairy also makes a great baby shower gift! Original flower fairy illustration in personalized with your child's name. Fairy prints are hand drawn before being scanned and colored digitally. I then print each flower fairy with a professional printer using archival inks, and acid free fine art paper. My children's decor prints are a standard 8x10 size and are ready to be framed! Artwork will be put in cello sleeves and a hard mailer. Don't forget to include the child's name at check out. © all photos and images are copyright to Kranky Krab. Purchase of print does not transfer reproduction rights. *Note: This listing is for the print only. Frame & matting are not included.